Oak trees with their broad canopies (Common Oak) and massive trunks have been a key feature of the British countryside and British history. While the most celebrated Royal Oak dates back to Charles II in 1651, the Hatfield's best known Oak goes back to Elizabeth I and 1558. The Oak or Quercus is one of the species of trees considered to indigenous to Britain (essentially, it came to Britain unaided after the last Ice Age. Other commonly found natives are Ash, Beech, Birch, Scots Pine and Yew). There are over 500 different species of Oak worldwide, and about 100 grow in Britain – many introduced by returning travellers. 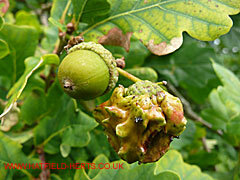 Ironically, one species – Turkey Oak (Quercus cerris) – has been found to harbour a wasp that damages the acorns of native species (Please see box below). Pendunculate Oak (Quercus Robur) also known as English or Common Oak, and Sessile Oak (Quercus Petrea), also known as Welsh Oak, live the longest and grow the largest in the UK. Not entirely surprising as they are also the only two native species of Oak (Mexico has the largest number of native Oak species). They are some of the largest living things on the British Isles – a large Oak can weigh up to 30 tons, cover 2000 square yards and have up to 2 miles of twigs and leaves. Each year they produce around 100,000 new leaves, which produce copious amounts of oxygen. 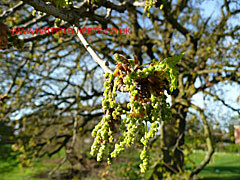 Male catkins (essentially, flowers arranged on stalks) of an Oak. In this case, the one growing behind the Hatfield Swim Centre. Mature specimens are said to support some 284 species of insects, which in turn support many species of birds. While their crop of acorns has been a bounty for animals from field mice and squirrels to wild boar. They have provided bounty for humans as well. Oak is a favourite hard wood, and its timber has been used to make everything from houses and furniture to British warships. Its bark was used for tanning. Its acorns used to fatten pigs. While smaller branches and twigs were used for charcoal and kindling. Queen Elizabeth I was said to have been reading a book under an Oak tree in Hatfield Park when a messenger rode up with the news that her sister Mary had died and she was now Queen. In recognition of this event, the coat of arms of Hatfield Town Council prominently bears an Oak tree (along with the three crowns associated with St Ethelreda's arms marking the town's history as Bishop's Hatfield – St Ethelreda, also known as St Audrey, was founder and abbess of the Ely monastery – now a cathedral, and became the patron saint of the Bishops of Ely). The original Elizabeth Oak has since died but its trunk has been preserved. On 22 July 1985, Queen Elizabeth II planted a replacement Oak on the site where the tree originally stood in Hatfield Park (which at the time of writing is still thriving). While Hatfield's association with an Oak with royal connections dates back to 1558, the most celebrated Royal Oak date backs to 1651. When King Charles II hid in the branches of one to escape the Roundheads following the Battle of Worcester. Since this event Oak has been a symbol of the British monarchy, and Oak Day was celebrated on 29 May. This Royal Oak was located in Boscobel but, like the Elizabeth Oak, has since died and been replaced by another (planted by Prince Charles in 2001). Still, the name has gone down in British history – Royal Oak is said to be the third most popular pub name and more than one British warship has borne the name. Oak trees litter English history – like the massive Greendale Oak. As the story goes, in 1724 the first Duke of Portland claimed he had an Oak tree so large that you could drive a coach and horses through it. When offered a wager (a bet) he got his woodmen to cut an archway 10 feet high and six feet wide in the tree and had his narrowest carriage driven through it the next morning. Not surprisingly, Sir Winston Churchill chose an Oak as his memorial tree, which was planted in the park at Chequers (the country residence for British Prime Ministers). Some of the oldest specimens of Oak in England are said to be found in the grounds and park of Hatfield House. There are many Oak trees lining the rounds in and around Hatfield, although most of these are unlikely to be older than a century or two (most are even younger). Young or old, with their canopies as nature intended or cut back by man (which is the case with most of the trees in the town), in their full glory or minus their leaves, Oak trees make Hatfield a nicer place with their presence. However, the ravages of pests, disease, pollution, vandalism, climate change and falling bee populations are all taking their toll on these jolly green giants. A gall is an abnormal growth of plant tissue due to an external cause. Knopper Galls are chemically-induced growth distortions caused by a wasp (Andricus quercuscalicis) which lays its eggs within the buds. The gall – with wasp's larvae inside – usually emerges between the cup and the acorn. In the example pictured above the cup of the original acorn is still visible. The wasp has a two-stage lifecycle and needs the Turkey Oak (Quercus cerris) to complete it. 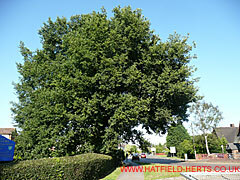 Of the two native Oak species it mainly affects Pendunculate Oak (Quercus Robur). Unfortunately, while Knopper Galls did cause some alarm, it is diseases like American Mildew and 'Sudden Oak Death' (Phytophthora ramorum) that are proving to be more deadly. Year by year, the number of grand old Oaks seems to diminish. Enjoy them while you can: the pictures in the photo gallery (link below for your convenience) and tree stumps may be all we have to look back on – if we do not look after them. However, one encouraging sign is the number of young Oak trees growing around Hatfield. These pictures are part of the Photo Gallery.